How to wear my gold ankle boots? During a style coaching, I advised one of my clients, a rather classic mid forties woman for was look for more style and simplicity, to purchase a pair of Sonia Rykiel gold ankle boots. At first she was disoriented, thinking those shoes were too eccentric for her but when I pointed out the many possibilities of matching this item with her wardrobe, she got convinced and purchased the booties. 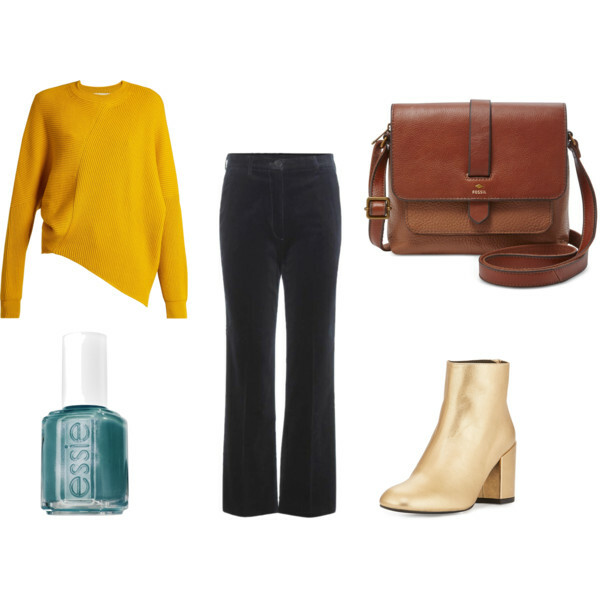 As I wish you could also enjoy the versatility of a pair of gold ankle boots (and just because creating outfit featuring them is so much fun) I decided to do a lookmaker about the topic for you. Remember that gold is quite a neutral. Could you thing of something that would mismatch a gold necklace? 1/ Cosy, funky and sophisticated all at once! I love to contrast the warmth of gold with the coldness of blue shades. Raw ripped jeans are the perfect balance to this otherwise refined outfit featuring sophisticated fabrics such as fine leather, cashmere and natural stones. Soft pink bag, cream sweater and creamy chocolate lipstick create a cosy feel to this look. What is best than ankle boots to make a LBD less dressy? And best than black boots… are gold ones! Paired with the otherwise classic night out combo (dramatic lips, shiny brown smokey, red nails and black clutch) they’ll make you stand out! You can create the same look with a longer dress with a leg opening. Romantic meets sporty meets parisian trench, scarf and lace booties. In this look the dark shades of the top, skirt and scarf are enlightened by the trench and shoes. Again I balanced the boots with raw looking jeans and chose baby blue as a cold contrasting shade. This feels like princess colors on a modern look. With navy blue cigarette pants and long sleeves or a blazer you can make this outfit work for the office. Short flare are all the rage right now. The good thing about them is that they really make the shoes stand out! They are perfect with booties. For this outfit, I stayed in a warm wintery palette around gold, brow and yellow. Only the turquoise of the nails contrasts. And you? Do you wear any gold clothes? Achetées il y a plus de 10 ans 2 paires, une couleur noir et l’autre en doré…je ne regrette pas une seule fois la paire en dorée, elle va avec tout et vous twiste une tenue comme seul le doré sait faire !